These photos are from about two weeks ago. The mosquitoes are very bad already and the horses were standing in the flood water (so much snow and a beaver dam on the creek). I think the bugs were not as bad in the water as the grass. My horse, brown and white paint on the far right, Went for a roll to get the bugs off. Silly Boy. 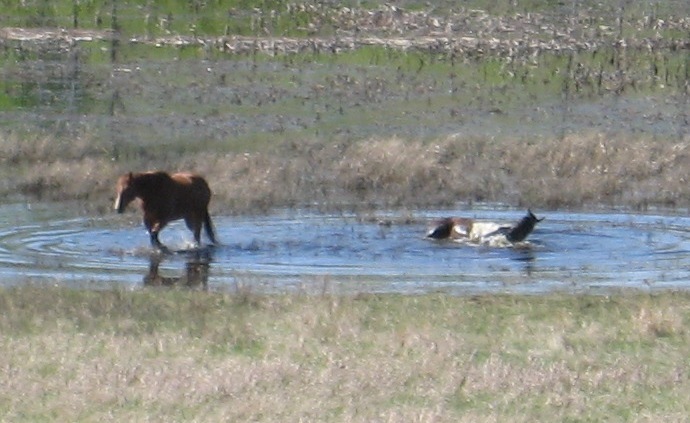 He kept trying to go all the way over but did not because his head would have been under water. While he was rolling his friends all took off for the barn yard and left him behind. 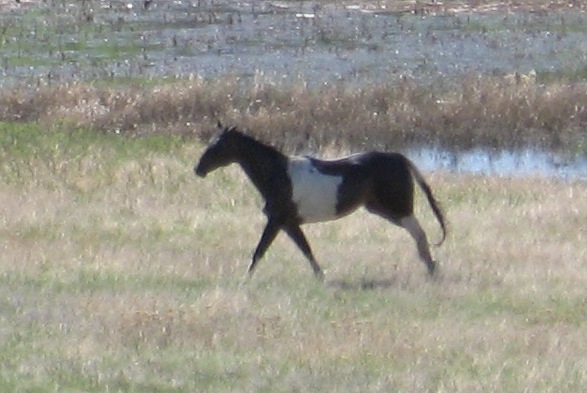 He galloped off the catch up. We now have a outdoor riding ring. We have got a fence up (no gate yet) and the ground turned up for a ring. With the bugs being bad it is nice to ride there now as the bugs are not as bad in the dirt compared to the grass. The boys have been riding and getting better too. Soon I hope to play some riding games. I will have to think back to my pony club days.